Attack of the Clones is my favorite of the prequels. My kids love this movie. A lot. We watch it more than Empire at our house. I love this movie too, and I frequently defend it from detractors. Across the Stars is my favorite Star Wars theme and this movie has my favorite of all the Star Wars soundtracks. I love the characters, the stories, the romance, the battles. I ship Anakin and Padmé. Their relationship is often the target of criticism both in universe and out, but Anidala is one of my favorite ships. I can't really separate the prequels from The Clone Wars animated series which added so much to the mythology and lore of Star Wars, not to mention a chance to get to know so many amazing characters. I am thirsty for Padmé. When the prequels came out initially, I missed the appeal and importance of the young senator from Naboo. Watching Attack of the Clones with my daughter, who quickly became enamored of Padmé, I began to consider the power and significance of Padmé. And now I can't get enough about her. Reading the novelization added to my love of this movie for many reasons. I think it is worth a read, and here's why. It's no secret that Shmi Skywalker is a character I admire and am desperate to learn more about. Such a kind and loving mother, who gave up her only son in hopes he would have a better life. Left a slave on Tatooine. We learn from the novelization that her marriage to Cliegg Lars is a loving one of equals, not one of compulsion. We learn that she considers Owen a son and he loves her like a mother. Shmi still thinks of Anakin constantly. There is one particularly poignant scene where she celebrates his birthday. Her tragic death is rendered even more heartbreaking by these character developments. One of the unexpected delights of the novelization was the insights shared about Jango Fett and his relationship to his son, Boba. Looking at their relationship through both Boba's and Jango's perspectives we see that the two genuinely love each other. Jango's training of Boba and Boba's adoration of his father are mutual and cemented Jango in my mind as one of the stand out fathers in the galaxy far, far away. This revelation was both the sweetest and bitterest pill to swallow. Because learning about Padmé's family was such an unexpected surprise that introduced us to not only wonderful characters, and added so much development to Padmé and her relationship with Anakin; but it also made me very bitter that the Naberries are not included in the film. Seeing Padmé in the context of her relationship with her parents (Ruwee and Jobal) her sister Sola and her nieces Ryoo and Pooja gives us a chance to see Padmé outside of her role as a senator. We learn that Padmé rarely thinks of herself outside of her work and her duty. Her awareness of Anakin's feelings toward her, and her own reluctant return of them softens the edges around what some consider a problematic relationship; and much of this insight comes from seeing Padmé interact with her family. 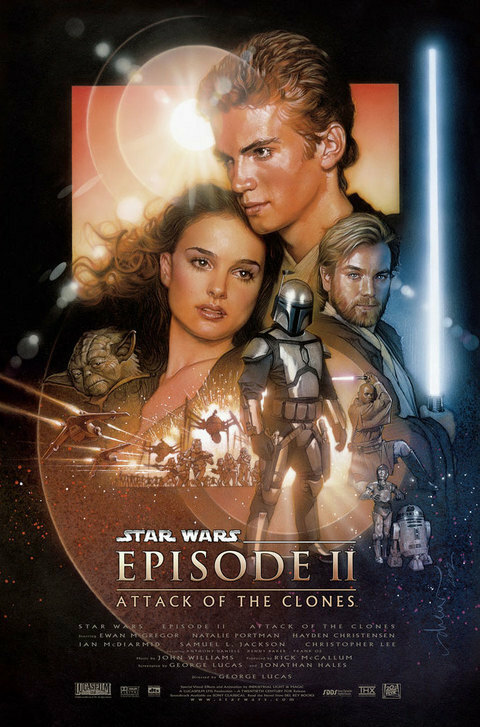 If you are seeking to embrace all of the storytelling and mythology that Star Wars offers us, I think Attack of the Clones novelization is well worth your time.